Every economy seat is made pretty much equal. The differences in economy come down to an inch or two more in width and/or pitch but all seats have the same general design. Unfortunately the same can not be said for Premium Economy seats. There are a huge range of differences between products and benefits associated with booking tickets in the Premium Economy cabin. I have flown on many of airlines that offer a true premium economy product. These are the five best and worst airlines to spend the extra dinero on. British Airways is one of the longest running airlines with a premium economy product or as they like to call it, World Traveller Plus. British Airways introduced the product in 1999 and there are still to this day some planes flying with the original seats still in them. With such longevity, the BA premium economy soft product has been cut down to bare bones leaving only the most cost-effective amenities. Put that together with their some awful small in-flight entertainment screens and you’ll wish you only bothered to pay for coach. They rank near the bottom for their dated product only. Seats on their newer retrofitted aircrafts are slightly more tolerable. With a super narrow 17″ seat, limited recline, and lack of frequent flyer earning potential it’s no question as to why this is the 2nd worst premium economy product you can fly. In addition to the flaws above WOW Air’s premium economy or “Big Seat” as they call them are only available on 3 airplanes, limiting their value even more. At the bottom of the barrel is Aeroflot’s premium economy. It should come as no surprise if you check out The Points Guys writer JT Genter’s review of the product. The seat is not only uncomfortable, but the amenities didn’t come with much more than a standard economy seat. There is limited limited alcohol, a very large premium economy cabin (48 seats), poor headphones and a difficult and misleading website which indicates you can lie down to sleep. American Airlines, Delta Air Lines, and United Airlines all offer a very similar hard product in premium economy. What sets American apart from the competition are its generous elite qualifying rates, Casper bedding, amenity kits, and pre-ordered meal choices up to 1 month in advance. In addition to all of the soft products that make it different, you can find the premium economy seat on all of their international flights and flights to Hawaii. Where as Delta and United have been slow to install their premium economy seats. Qantas has some of the best seats in the industry with their A380’s having seat pitch as high as 42″ and up to 20.5″ wide. These are necessary as they fly some of the longest routes in the world. 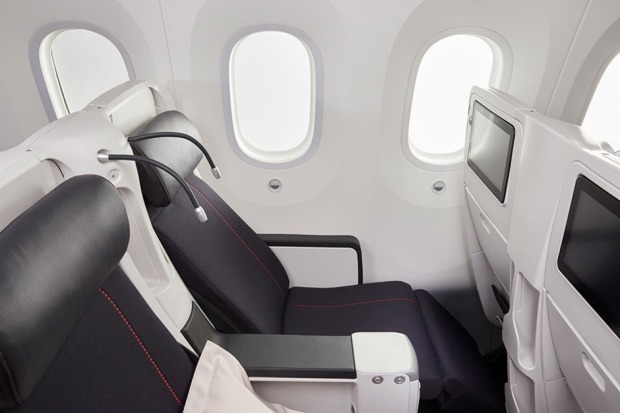 In addition to a great seat, Qantas’s premium economy benefits range from complimentary noise canceling headphones, enhanced bedding, Rockpool pre ordered meals, and priority ground services. With solo seats and seats that are large enough to fit Sam Chui himself for 19+ hours, it’s no wonder why Singapore Airlines ended up on this list. In addition to a large seat, Singapore airlines makes the #3 spot because of its amazing book the cook program, complimentary noise canceling headphones, large inflight entertainment screen, priority ground services and seats that have both leg rests and foot rests. 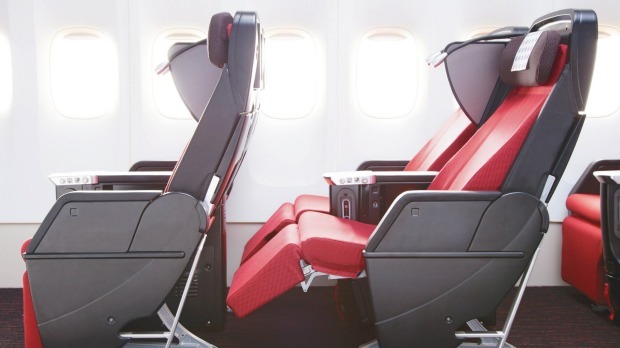 Japan Airlines arguably has the worlds most comfortable, easily accessible premium economy seat. The seats are in a fixed shell so you don’t get reclined into, and offer 42″ of pitch. On top of that, all premium economy passengers get priority ground services, business class lounge access, amenity kits, and enhanced beverage options. Given the opportunity, it is always a pleasure to fly with them. Theres no doubt, Thai Airways isn’t the best when it comes to the soft product. They do have one MAJOR advantage over the competition, Flat Beds. Yes, that’s right Thai Airways sells its lie-flat, direct aisle access, business class seats as Premium Economy on select routes from Bangkok to Stockholm, Copenhagen, Moscow. Yeah very disappointing that you don’t mention Air New Zealand. This airline has won best Premium Economy in the sky year after year, but no mentioned at all! AIR NZ offer a far superior Premium product than any of those carriers you’ve reviewed and listed. I traveled on SQ Premium a month ago and was severely underwhelmed; it was more Economy than it was premium, serviced by the same cabin crew as Economy and shared bathrooms with them as well. Odd you didn’t mention Lufthansa, LOT, Turkish, or EVA. Eva’s Royal Loreal Business Class, and its Premium Economy, have been industry leaders for 10-20 years! I feel like there’s unnecessary BA hate around. The PE they used in this article is the old configuration. They now have much bigger screens and wonderful cabin crew. This year they are also updating their PE. I don’t understand why there’s so much hate for such a wonderful airline. Their old product is still very very easily available. Once their oldest 747’s get retired they will get off this list. It’s pretty obvious that this isn’t the most valid review. There are plenty of other airlines that should have made it to the list of best PE like Air NZ and Cathay and didn’t. American Airlines and Thai shouldn’t be up there. Also the SQ PE isn’t a single seat for all its fleet, only A350 that does SIN-EWR. Airline bloggers should keep their bid aside n do an honest review instead. BA was awful, it was an old cabin, entertaiment was minimal and the screen was tiny, we were promised a choice of 2 meals from club class, nothing doing, straight forward Y class food, also the blurb said cream tea, nope, basic Y class finger sandwiches which were cold, hard and stale. Compared to the early years of BA world trav plus, this was a massive let down and just reconfirmed my thoughts of BA, – ABBA – Anyone But BA. These days trans Atlantic is VS and beyond Europe is ME3. Flew on Scoot 787, which has exactely the same seats as Notwegian and found them very comfortable. The most important thing is space on a long trip. Scoot offers the same downsized service as Norwegian, which has nothing to do with businees class, even though they call it Biz Class. I think Norwegian is very negativly judged by you. After reading Norwegian Premium listed as the 5th worst premium economy product I just skipped the rest of the selections. The author is not worth reading. 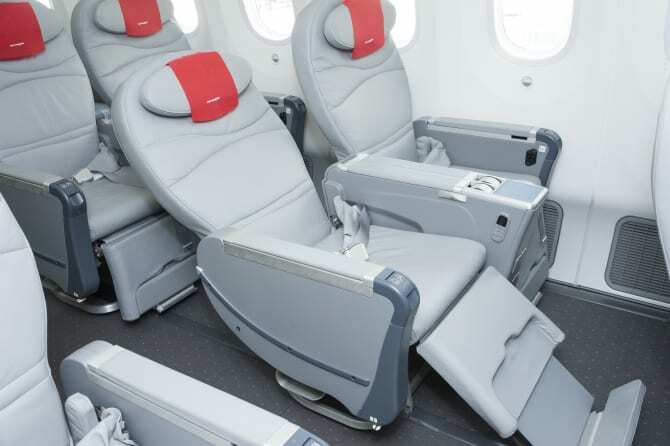 Norwegian Air Shuttle has the best premium economy product in the skies with 43-46 inches of pitch and an actual leg and foot rest in all seats. The recline is great and can definitely be comfortable enough to sleep in. Given that Norwegian Air shuttle premium is often the cheapest premium economy option on the market and is comparable to many legacy carriers discount economy fares, to not put it as number 1 best premium economy makes this blog worthless. Well if the price is considered it would be a totally different story. Aeroloft and Norwegian are famous for their cheapest flight from EU to US and China. A return PE from China to Scandinavian is about 600USD compared with CX of double or triple the price. You can use CX’s PE to even buy a ticket for SU’s biz. Another example is that everyone says Ryanair is the worst airline in EU, but when you check its CAGR it is a different story. Everyone loves Ryanair but they nevet talk to others hah. American? Seriously? This is the airline that give out almost zero upgrades even with status, has the worst flight crews and ground staff and has yet to bother to add “Economy Comfort” to the aircraft they inherited from UA Air. Sorry, the flight that do have those seats, at least domestically, are nothing to rave about and are certainly not better than neither UA or DA. I don’t know what airline you are flying but it’s not the AA whose crappy A321 I’m sitting on right now. AA Premium Economy to/from Hawaii is a joke….Not even close to the way you explained the amenities offered. One drink service, the same boxed sandwich that is offered in coach, and inattentive, almost rude flight attendants. I would NEVER spend the money to fly on AA to Hawaii in Premium Economy again. Thanks for confirming my recent experience, Sam. Just flew AA in Premium Economy MIA to CDG on a 787-900. I had a great experience. Plenty of amenities and legroom. Returned through LHR on an orignally configured BA 747 in World Traveller Plus, The seats were horrible, the TV screens were impossible to see and there was no legroom. In addition to being delayed 5 hours for mechanical problems, the 9 hour return flight was torture. I am finished with BA. Hello Sam. Thanks for the informative overview. I am missing under the top 5 the Premium Economy from ANA, which i was unfortunately to experience several times on my flights to Japan. PS: Keep up the extraordinary work. What is the cheapest airline to go on from Manchester (UK) to Trivandrum or Cochin (India) with a family of 4? Not the most fair and justified article from someone with respectable views on Airlines and their products. For example, between the 3 major US carrier, for me Delta Premium Select is the best compared to AA or UA (does UA’s Economy + cabin even be compared?) especially from the amenities provided – far better than AA for certain. Indeed, where is AirNZ, EVA Air or even China Airlines – not tried the last 2 – but I believe all 3 should be at least in the Top 5 list. I am wondering if you have tried Cathay Pacific older version premium economy. I tried it on HKG-YVR-HKG and it was comfy to sleep due to good padding. Norwegian PE is the best by far for space and equipment. Who cares about the lack of miles when you are paying 25% of the cost and get 42 inch pitch. You should try Aeroméxico…. Same seats as sardine-packed economy but with just 2 inches more pitch. Food abysmal, in-flight entertainment a joke, Crew hardly available when lights go off etc. The only, and only, plus with AM is they allow a lot of bagage. The worst by far British Airways. I am surprised that you failed to mention EVA Air because they offer a very credible PE product equal, IMHO to Singapore Airlines for substantially less $. Have you been in United Economy Plus? Why is it not in the list of the worst?? Likewise Aeroflot hate is not justified. Meals are different and better than in economy. There are two free checked in bags like in business. They use new planes and very polite personnel. All in all it’s anything but worst PE. SAS is worse for sure. What a crock! Little sepperates be from as per, other than lounge access and the age of the seats. Let you rank one in the top and one in the bottom? Sure the AA seats are newer, but my sore behind doesn’t care how dated the seats look. The space on ba in both pitch and width is on the top end of the range for American. I rather know going in that I’m getting 90% of what I might 100% of the time instead of being cramped into a space more or less the same as economy. Longer access I nice, especially flagship lounges on American, but that doesn’t make the FLIGHT more enjoyable. Yes, I find it a MAJOR oversight that you didn’t list Air New Zealand & Virgin Australia/Atlantic for their PE products (both of which are MUCH BETTER than AA’s for example) which are actually VERY good PE products that I myself endorse. They should have also been listed. I agree with Singapore, Qantas and Air France PE all being listed, though I disagree about Air France’s PE being an inferior product. It’s one of the best PE’s out there that I’ve flown (along with Air NZ and VAus/VA) with probably Delta’s Comfort + being the worst I’ve flown. You’re really stretching with including Thai’s “premium economy” on this list – just because they are listing it as a PE seat on a single route they charge out the nose for. I could just pay to fly Business on TK for half of what they are charging – and most other major airlines had biz prices over $1000 lower than what TK wanted for “PE”. I would personally include Air NZ on here for their great PE product and service on board. Air NZ also seems to be heavily invested in R&D on the next big thing for long haul pax experience as they introduce different seating styles throughout the economy and PE cabins. Agree. Air NZ has by far the best PE. And Cathay beats American any day. Unnecessary Norwegian hate here – seemingly coming from a very pro-legacy standpoint. Sure, no ‘conventional’ mile-earning, but you will earn Cashpoints (effectively money off future Norwegian flights) – and at an exceptional 20% rate on flex tickets (in other words, something like a free economy round trip within Europe after flying one-way Transatlantic). And it is a different food and drink offer in premium to economy – it’s boxed, and no tray/plates/silverware, but still very much an upgrade. This is a very poor article. For a start Norwegian PE should be in the best 5 not worst – on pitch and lounge alone . How tall are you? The main reason for a lot of people buying PE is space. Including Thai in this ranking is really just pointless, just a technicality. Doesn’t Norwegian Premium Economy come with lounge access? On their routes out of LAX, I believe you get access to the QANTAS Business Lounge. Norwegian has now stopped giving PE lounge access, unless it’s fully flex. You are wrong with Norwegian and earning “miles”. You dont get miles as such, but still earn cashpoints, which can work as a further reduction on next flight.